The war of words continues between Netflix and America's largest Internet service providers (ISPs)—an argument that is not only seeking to lay blame for poor video streaming speeds in the U.S., but is also providing the public a crash course in how the Internet works. The latest rhetorical salvo comes from Verizon, as part of an ongoing sparring match between the two companies. As far as Verizon sees it, the problems any of its wired Internet subscribers have with Netflix is because of the video streaming provider and not Verizon. 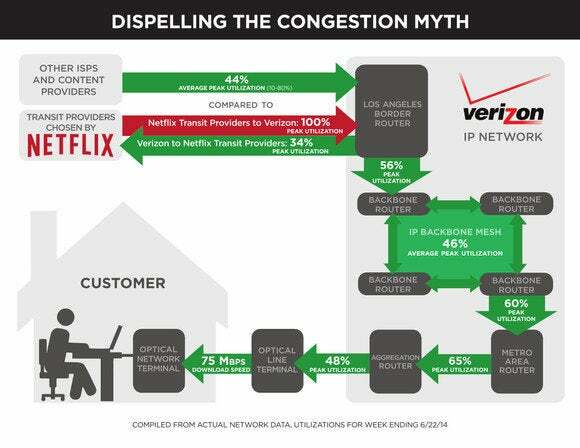 A Verizon infographic seeks to blame Netflix for slow streaming speeds. Verizon suggests that Netflix is probably too cheap to pay for enough capacity for its traffic to enter Verizon's network. "Netflix sends out an unprecedented amount of traffic," Verizon said in a blog post on Thursday. "For whatever reason (perhaps to cut costs and improve its profitability), Netflix did not make arrangements to deliver this massive amount of traffic through connections that can handle it." To get from Netflix's server to your home, Netflix traffic typically travels over "backbone" Internet providers. These networks serve as the connection routes between companies like Netflix and customer networks like Verizon's. Similar to a busy highway, Internet traffic has chokepoints where bottlenecks can occur. The point where a backbone provider meets an ISP network is one such place. Netflix and Verizon both agree that this is where the traffic problem lies; however, the two companies disagree on who is to blame. "Congestion at the interconnection point is controlled by ISPs like Verizon," a Netflix spokesperson said in an email to TechHive. "When Verizon fails to upgrade those interconnections, consumers get a lousy experience despite paying for more than enough bandwidth to enjoy high-quality Netflix video." Verizon, on the other hand, says Netflix and its contracted backbone providers need to help cover the costs of upgrading the number of connections. In a small test in June, Netflix displayed network speed messages to subscribers. In early June, Verizon threatened to sue Netflix over the video streaming provider's decision to display messages to its customers whenever Verizon's network speeds weren't optimal. "The Verizon network is crowded right now," Netflix would display to streaming customers. "Adjusting video for smoother playback..."
Following Verizon's threat, Netflix said it was only showing those messages to a small number of consumers in a pilot project scheduled to end on June 16. Netflix said it would then evaluate the program before rolling it to more subscribers. Although the two companies are having a public spat right now, it appears an end to the hostilities is on its way. At the end of its blog post slamming Netflix, Verizon said it was "working aggressively" with the online video provider to create direct links between Netflix and Verizon. But before you start cheering Verizon as the champion in all this keep in mind that Netflix and Verizon reached an interconnection deal in April. That agreement was to allow Netflix to bypass bottlenecks and connect directly with Verizon's network. In other words, those connections Verizon is "working aggressively" to create have been in the works for close to three months.